The judges opinions differed greatly in the Grand Prix Freestyle in Lier. With 76,445% Anne Meulendijks won the victory with a big lead over compatriot, Diederik van Silfhout. Together with MDH Avanti NOP, Meulendijks did a nice test where she got an eight for the pirouettes and extended canter. The coordination with the music and balance between horse and rider gave the decisive factor for a winning score. Belgian judges Jacques Van Daele and Freddy Leyman placed the pair at the first spot. 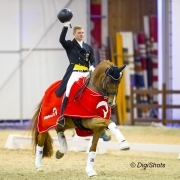 Diederik van Silfhout took second place in the saddle of Expression NOP. A constant test with nicely executed pirouette yielded 75.550%. Ulrike Prunthaller ended third with Bartlgut’s Quebec. The duo gave a restless impression on the extended step, resulting in a final score of 75.050%. For her own audience, Jorinde Verwimp scored sixth place with Cape Town with 72.33%. View full results here . The win in the juniors was for Lucie-Anouk Baumguertel with Zinq Sweetheart FH . In the team and individual test, the duo got twice the second place in the past few days, but with 75.708% in the freestyle they were the best by far. Katelijne Maes and Ibou van de Kapelhoef followed a second place with a score of 73.417%. 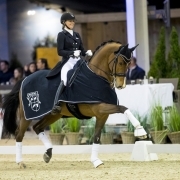 Jorinde Verwimp gained a second place in the Intermediate I with her Kastar Hof ter Zeedycke D’12 who was the Belgium champion of the seven years old in 2017. Verwimp rode the nine-year-old BWP-bred son of Game-Boy D’10 to the second place with a score of 71,324%. 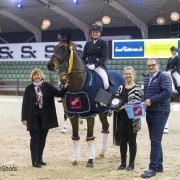 Which was a close call on the total score of 71.471% of the winning German combination Ann-Christin Wienkamp and Nymphenburg’s First Choice (Fidertanz). Third place went to the German Andrea Timpe and Don Carismo 2 (Don Crusador). They scored 70.676%. The fourth place went to Belgium again. Thibault Vandenberghe and Santiago Song (Sir Donnerhall I) accounted for a score of 70.529. View the full results hier . Nicolas Wagner wins with his Quarter Back Junior the CDI4* Grand Prix with 72,848%. The start of his test wasn’t the best. But the combination recovered strong what was good enough for a first place. Judge Maria Colliander was crazy about Anne Meulendijks performance. 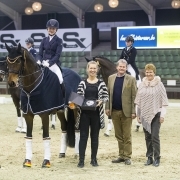 But in the end Meulendijks had to take second place with MDH Avanti NOP with a score of 72.609%. Meulendijks rode a constant test with strong canter. The passage was also done nicely. Diederik van Silfhout followed in third place with Expression NOP. Van Silfhout scored even with a few mistakes at the end of his test a total score of 71.435%. 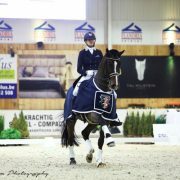 Fanny Verliefden scored a total of 70,935 with Indoctro vd Steenblok and was placed first by the two judges Jo Graham and Jacques van Daele. But with her total score she ended a fifth place.